This is a tutorial for people who have X-Plane 10 and want to battle AI enemies with fighter jets. How to do this is not obvious at all, and I can't find a guide on the Internet that encompasses the entire setup. So I will try to explain everything here. First, we go over how to find an aircraft with weapons, and how to install weapons on an existing craft. Next, we enable enemy aircraft that try to shoot you down. Finally, we configure the controls necessary for combat and describe how to use them. Most fighters will come with weapons attached, but some don't. Most notably, the FA-22 does not have any weapons by default. A good jet that comes with weapons is the Blue Angels FA-18F. Open the aircraft in Plane Maker. Under the 'Expert' menu, select 'Default Weapons'. Select the empty checkbox to the left of the rightmost textbox. Select a default weapon for that slot. If you want to experiment with creating your own weapons, go in 'Expert' > 'Build Weapons'. This is not necessary though, some weapons should already be present in the default installation. To check the status of the weapons while in X-Plane, select 'Aircraft' > 'Weight and Fuel', then switch to the 'Ordinance' tab. If you run out of ammo/missiles during combat, you can click 'Re-Arm to Default Specs' to replenish without restarting the simulation. To add enemies, start X-Plane and go into 'Aircraft' > 'Aircraft & Situations'. Switch to the 'Other Aircraft' tab. Change the 'number of aircraft' setting so that there are as many extra aircraft as you want (that number includes your own aircraft). Check the 'save all craft in preferences' box, so that your aircraft selection is saved and not re-generated when you restart X-Plane. On the same tab, you should now see a list of aircraft. Select the aircraft you want to fight against (you probably want something with weapons, so your enemies can fight back). Assign yourself to a color team (e.g. blue), and assign all of your enemies to a different team (e.g. red) by selecting the appropriate box beside the aircraft. The aircraft you just added will be present in the simulation every time it starts. You can usually find them flying around not too far away from the runway you take off from. In the next section, we'll explain how to use your radar to find them. In this section, we explain how to use the radar to locate and target enemy aircraft, and how to select and fire weapons. Use the 'Weapon select up' and 'Weapon select down' keys to select a weapon. Usually there is a knob in the cockpit that points to the selected weapon. Once you have selected a weapon, press 'Fire all armed selections!' to fire. The default FA-22 is a special case. It doesn't obey the weapon select keys. You have to manually flip the switches beside the throttle to enable the guns and/or missiles. The switches are not visible in the standard view. You have to press 'q' to look left. To fire air-to-air missiles, you have to be targeting an aircraft. Targeting is explained in the next section. 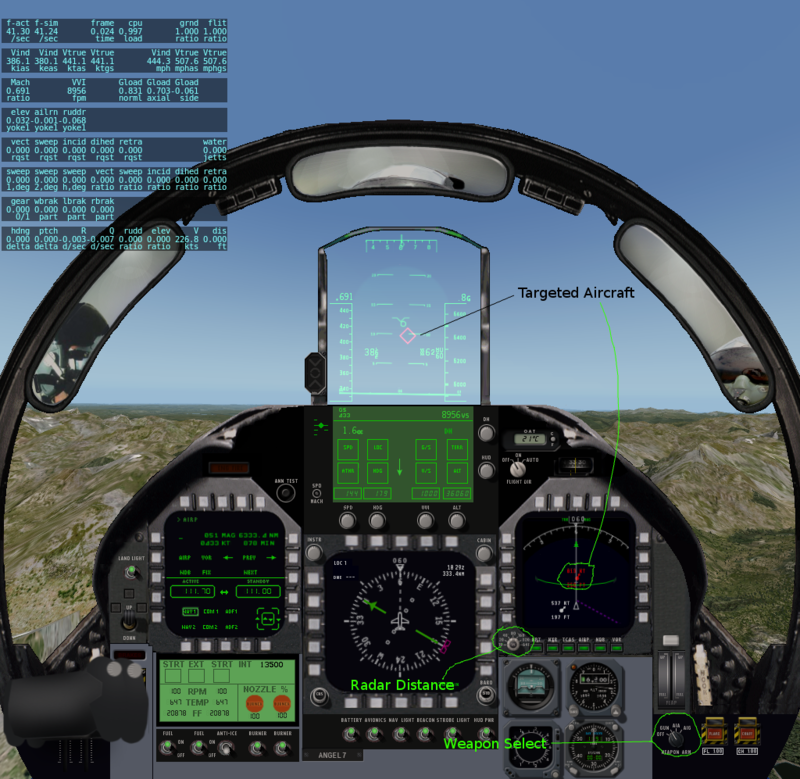 Your jet should have a radar screen in the cockpit that shows you the relative location of other aircraft. There is usually a knob that controls the range of the radar, so that you can choose between a more-accurate view of nearby planes and a less-accurate view of aircraft that are further away. In most jets, selecting a weapon switches the radar to TCAS-only, so that only other aircraft are shown (airports and other annoying things that you don't care about in combat are not shown.). When you can see other aircraft in your radar, press 'Target select up' and 'Target select down' to target them. Once you have an aircraft targeted, it will be highlighted in red on the radar, and (in most jets), the HUD will draw a red square around the target when it's in your field of view and a line pointing to it when it isn't.